Dental implants are a permanent tooth replacement solution that have helped millions of people confidently restore their smiles. 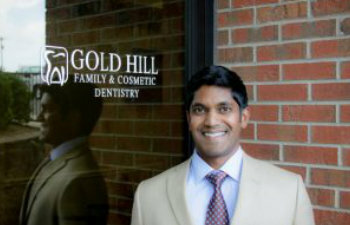 At Gold Hill Dentistry, we are a comprehensive family dental practice in Fort Mill that delivers superior, patient-centered dental care including general dentistry, cosmetic dentistry, and complete restorative dentistry. Both Dr. Jennifer Mokris and Dr. Kavi Sagunarthy are passionate about creating beautiful, healthy, and long-lasting smiles for all of our patients. Dental implants have given patients who have missing teeth new hope. For a very long time, the only options for replacing missing teeth were bridges and dentures. Bridges have been a reasonable choice for many; however, because neighboring teeth also have to undergo dental work in order to hold the bridges in place, they are not as desirable as dental implants. Dentures have also been an option, but many people find that they do not look as natural (especially partial dentures), and they run the risk of embarrassing slips while speaking and eating. Dental implants are a permanent solution that does not involve surrounding teeth in the implantation process. An anchor root is surgically implanted into the bone where the missing tooth used to be, and a crown is fitted over the anchor. Yes, the process is a bit more involved than laid out here, but it is truly a breakthrough in restorative dentistry that is allowing patients to find a confident, permanent solution for missing teeth. If you are interested in learning more about dental implants and if they are the right solution for you, please contact Gold Hill Dentistry today. We are currently accepting new patients, and we would be proud to work with you to achieve the fully restored smile that you deserve.